Watch your favorite live streams with Mediaplayer on your PC, Tablet or Notebook with only some whole clicks. Record instant your favorite live streams with only some whole clicks. Watch your favorite VOD's with Mediaplayer on your PC, Tablet or Notebook with only some whole clicks. Record instant your favorite VOD's on your PC, Tablet or Notebook with only some whole clicks. Set the time when your favorite Stream goes online, and the broadcast will saved as mediafile. 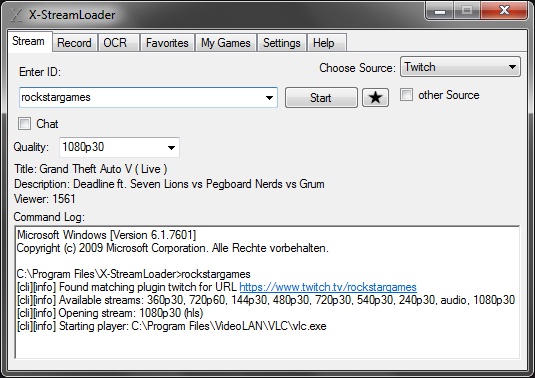 If the time is not known when your favorite stream goes online, use the Online Check Recording (OCR). The program will check continously if broadcast is online, and begins the recording if broadcast has started. To open quickly your most watched broadcasts, save it as favorite to have it comfortable in Dropdown menues. To open quickly game directorys from Streaming platforms (like Twitch, Smashcast, Mixer eg.) add the game to favorites and display it in browser with a doubleclick.